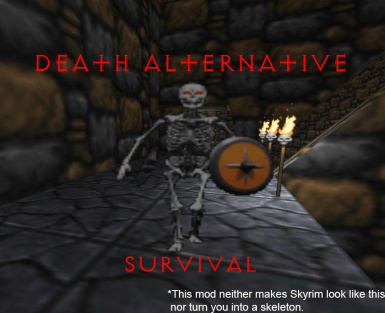 An addon for Death Alternative - Your Money or Your Life which changes the consequences for death to make them more meaningful and to create light survival gameplay. -Fix to prevent blacking out when failing a brawl. -Update to accomodate changes in daymoyl 4.51. -Minor fix for surviving a blackout while recovering. The bleedout health bar no longer matters. When your health reaches 0 you will fall on your knees if you have a follower. 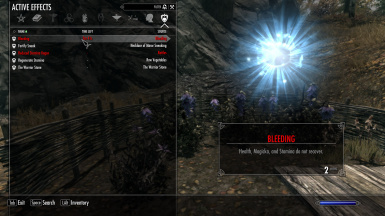 Whenever this happens you will receive a random disease unless resisted and the "Bleeding" debuff which stops all regeneration for 3 minutes. While on your knees all enemies will stop attacking you and focus on your follower (just like with protected followers). If your follower survives long enough you will be able to get back into the fight as usual. You can use the waiting functionality to stop your bleeding right away. 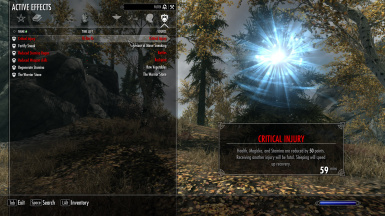 If you don't have a follower or he gets knocked out while you are on your knees you will black out and receive the "Critical Injury" debuff which lowers Health, Stamina and Magicka by 50 and lasts 1 hour. If you black out again with this injury you will die. The timer for this isn't affected by waiting or your timescale; due to technical reasons it won't visually tick down but keep displaying 1 hour (or later 15 mins). The only way to cure it quickly is by sleeping. An owned bed completely cures it while simply vacant beds change the effect to "Recovering" which lasts only 15 mins, reduces attributes only by 25 and allows for a chance to survive another black out. "Critical Injury" also naturally turns into "Recovering" after 45 minutes. 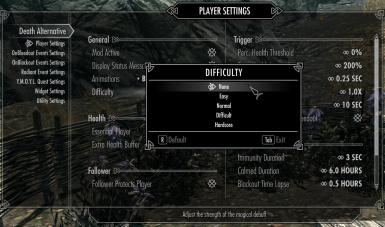 -In the Death Alternative MCM set under "Player Settings" the difficulty to "None" to allow my mod to handle debuffs. Set "Bleedout Damage Mult." to 2.0. 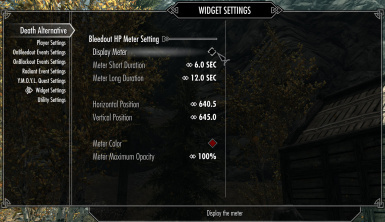 -Under "Widget Settings" uncheck "Display Meter" to hide the bleedout health bar which is no longer relevant. Otherwise just plug & play.